This article, focusing depression treatment with tDCS, is the second in a series. Future articles will examine the use of tDCS for treating chronic and phantom pain, using tDCS to enhance learning, and more. Why Is This Such an Important Topic? Depression is epidemic. According to the CDC, as of 2010 approximately 1 in 10 adults in the US is suffering from some form of depression. That translates to about 25 MILLION individuals! In 2008, over 600,000 people were admitted to hospitals because of self inflicted injury and there were over 36,000 suicide deaths. The importance of tDCS as a simple, inexpensive, and effective treatment to address some of this epidemic is obvious. tDCS is NOT electroshock therapy and should not be confused with it. tDCS involves applying a very low voltage and current (1 milliamp) to the head via saline sponges, typically sourced from a tDCS device powered by a 9 volt battery. What? A 9 volt battery? Yes – the lowly 9 volt battery may end up curing more cases of depression than pills ever have! The mechanism by which tDCS treats depression is well understood. The tiny tDCS current decreases the excitability of neurons in the area of the prefrontal cortex commonly associated with depression. A typical treatment goes like this: A sponge connected to the negative lead of a tDCS device is placed on the forehead, above the right eye. The sponge connected to the positive lead is placed in the area above the left temple. (Exact placement varies depending on treatment effect desired. Some studies have used other placements.) 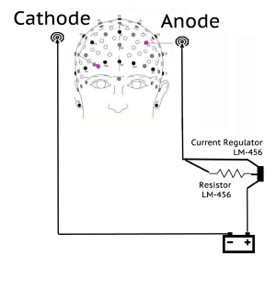 The tDCS device is turned on and runs for 20 minutes. The patient feels, at most, a slight tingling under the sponges. Treatment is repeated every day for 30 to 60 days. In some cases followup treatment once per week or once per month may be required. That’s it. Research by institutions and individuals shows tDCS to be very effective. No expensive drugs, no drug side-effects, just results. There are a few doctors and clinics now using tDCS to treat depression. A prospective patient may have to search high and low to find one, but they are out there. They should be much easier to find in years to come. Because a tDCS device is so simple and the procedure so safe, treatments can be done at home. There are commercial tDCS units that can be purchased (typically $400 or more) – and your doctor may prescribe one. However, a tDCS unit can also be easily built. This is not a suggestion to do so – but it is being done – by those who can’t afford a commercial unit, who can’t find or afford a doctor familiar with tDCS, or who have fallen through the cracks of traditional depression treatment and are simply desperate for help. 2. Use a digital volt meter (DVM, available from many sources including RadioShack, Home Depot, etc.) to verify current flow during a tDCS session. 1 ma is commonly used in tDCS sessions. 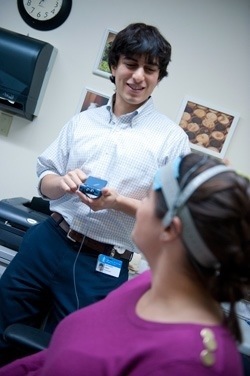 tDCS is being shown in study after study to be safe and effective. Even when used with patients who have not received relief from traditional methods, tDCS provides significant improvement. Given that tDCS is effective in treating depression, is very safe, extremely simple, and potentially very low-cost, medical professionals and the FDA should do all they can to move tDCS forward to it’s rightful place in the toolkit of treatments available to all depression patients. Through tDCS, it is possible that the suffering of millions could be dramatically reduced or eliminated – and many thousands of self inflicted injuries and suicide deaths prevented. Reason enough for everyone, especially in the medical community, to give tDCS the attention is deserves. I normally write about emerging technologies that affect k-12 and higher education. I stumbled upon Transcranial Direct Current Stimulation (tDCS) as an effective treatment for depression while following leads for articles on other topics – and was stunned by what I read as I dug deeper and deeper. tDCS is simple, simple, simple, and has been around for 50 years or more. Its effectiveness as a treatment for depression has been known for nearly that long. So why has it not become one of the mainstays of depression treatment alongside prescription medications and counseling? I don’t have that answer, but it might be worth the time of a good journalist or a congressional investigation to find out. As tDCS gains new significance as an effective depression treatment via web sites, blogs, and the work of research institutions, it will be interesting to watch the reaction of pharmaceutical companies. They stand to lose billions of dollars. Will they try to derail tDCS as a depression treatment via advertising or “sponsored” research? Will the FDA be paying attention? It will be interesting to watch. 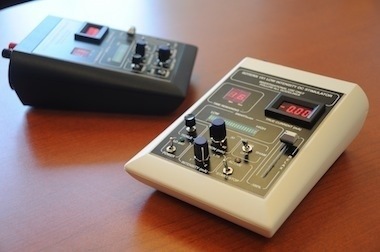 ← tDCS: Can a 9 Volt Battery Save Your Life or That of Someone You Know? Pingback: The tDCS craze | fsckYouBrain! I am a law-student andi am a sportswoman who completed 4 Europeanchampionships full contact Karate. I also have Asperger and i am not so rich that i can efort myself a tDCS. I have epilepsy and i cant pay the amounth to buy a tDCS. I don’t sell tDCS devices. See https://thebrainstimulator.net/product/advanced-tdcs-travel-model/ for a complete tDCS device for $105 US. I don’t know what shipping costs would be to your location.